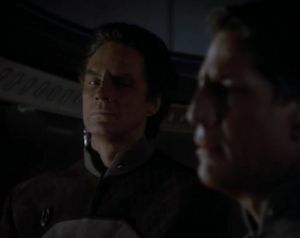 Deep Space Nine is invaded by Bajoran rebels intent on removing the Federation from the station, as Kira and Dax attempt to bring evidence of Cardassian involvement to the provisional government. The scene where Sisko strangles and yells at Quark is a great show of anger. The writers have expressed annoyance that Li Nalas becomes "lost and superfluous" after "The Homecoming." I disagree. This episode wouldn't have worked without him, and the whole arc hinges on his character's acceptance of his role. Vedek Winn is such an awful human being, which is what makes her such a wonderful villain. General Krim is also a great opponent, especially since we were already introduced to him. He is calculating and intelligent, which makes him seem both cunning and unpredictable. He is more intimidating through his patience than he would be if he were quick to act and bluster. You just get the feeling he totally understands Sisko and is spending his time figuring out how to beat him. His only mistake is in taking too long. I can't believe that guy from Wings fell for the holodeck trick. What a dumbass. This episode, along with the two that precede it, are best examined as one continuous story, and it's the kind of story that wouldn't have worked in TOS and would be tricky for TNG to pull off. DS9 has always fiddled with bigger and more complex stories that can't be told in a single episode, and this arc is the best example yet of the grandiose political machinations and character interactions the show is capable of delivering. TNG was able to have a couple of similar stories during its run--including "Redemption" and "Unification"--but it was much easier for the Enterprise to just move on without dealing much with the repercussions. On DS9, it is absolutely imperative that the consequences of this entire story be felt from the next episode on, and it is genuinely starting to feel like, if the show continues to have epic events like these play out, it will have to abandon its episodic nature almost entirely before long, in favor of a more serialized form of drama. This isn't the last time Deep Space Nine is evacuated.